Leary is a small town with a population of just 670. We had our revival meetings Sept. 29 – Oct. 4, followed by a three-day Global Missions Conference where two pastors from Zimbabwe, Africa came to share. We did some groundwork to invite the other Baptist churches – especially the traditionally African-American Baptist Missionary churches– and held the meetings in different churches. It was soon rumored that Leary Baptist Church was “integrated.”Truth is we baptized the first African-American family into the church over a year ago and we have a healthy youth program with a large portion of African-American young men and women. Anyway, when revival time came there were more African-American saints in the auditorium than our members. Pastor Steve Keener of Friendship Baptist Church in Bartow brought inspired messages direct from the Throne. Many came to the altars in repentance and faith towards Christ, others – both Anglo and African-American – came in deeper surrender to His service. But the real miracle occurred the first night of the missions conference. The sanctuary was packed with believers and about halfway through the song portion the Holy Spirit fell on the place. A church that was divided by a center isle, Black on one side and White on the other, witnessed a transformation as people began, unprompted, to change seats in order to sit with their newfound brothers and sisters of a different color. That night at the invitation the pews poured out completely as people came confessing their bigotry and hatred. It took over an hour to pray with each one and allow the Spirit to minister to each soul. The next two nights, continuing late into the evening, were electric with the presence of God. The pastors of the three churches have all been asked to make a way that we can worship together regularly. We are praying and planning to make this a reality. I believe this is revival, though an unexpected manifestation of it. The town has a documented history of the racial stronghold that has held it hostage since the Civil War. 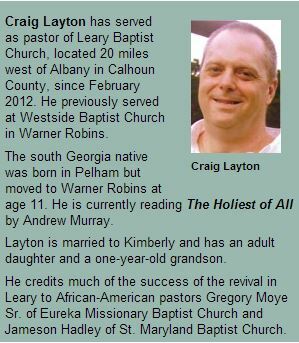 Leary Baptist has an average attendance of 35 in morning worship and we are statistically the poorest county in Georgia. The town is near to shutdown but God has moved in such a mighty way that His church has taken center stage in the conversations and hopes of its citizens. Lost people are approaching me to say they have heard that God has helped the little community. I’ve already had the privilege of seeing such ones come to Christ and baptizing them. And I’m not the only one experiencing such encounters. I ask you and all of your staff to pray for the saints of Leary and this movement of God. And I hope you will share this story as an encouragement to others who are laboring under the burden in small churches. This is unlike anything I have ever witnessed before. This is surely historic and nothing short of miraculous. Please take a minute and visit this website describing the events. https://learybc.wordpress.com/2013/10/15/revival-2013/.